“We have a chance to be pioneers and lead the way,” says Kohilan Selvakumaran, a fourth-year Health Sciences student and former HLA participant. From left to right: McMaster students Tiffane Anandarajan, Theebha Prethipan, John Vu, Selvakumaran, and Devin Glim. On a crisp fall morning in New York City, Co-Director of the McMaster Autism Research Team (MacART), Dr. Stelios Georgiades, prepared for a day of exchanging ideas with renowned experts in the field of autism research. Hosted by Autism Speaks, Dr. Georgiades was one of several experts at the global meeting this past September. While he expected the gathering to be full of rich discussion, Dr. Georgiades did not expect the work of McMaster undergraduate students to help guide conversation at this esteemed event. 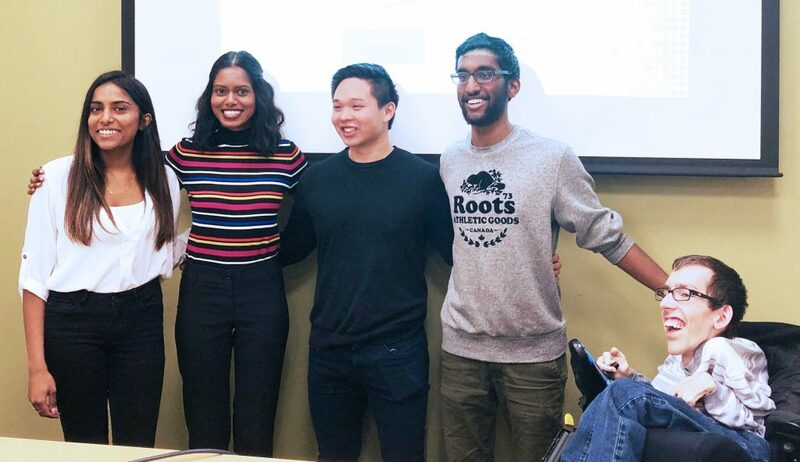 As a project sponsor for the Health Leadership Academy’s (HLA) Innovation by Design course, Dr. Georgiades worked with five undergraduate students: Tiffane Anandarajan, Kohilan Selvakumaran, Devin Glim, Theebha Prethipan, and John Vu. Jointly overseen by the faculties of Business and Health Sciences, the HLA was designed to have a transformative impact on healthcare by educating future leaders, supporting research activities, and hosting engaging events. It’s based at the DeGroote School of Business’ Ron Joyce Centre in Burlington. With the guidance of Dr. Georgiades and the HLA, the group used design thinking — a user-centred approach to problem solving — to address the lack of services for children with autism. At the global meeting this September, Dr. Georgiades was astounded when he heard ideas forming that sounded very much like the prototype the McMaster team came up with almost a year earlier. Whereas the global researchers were looking at a post-diagnosis resource for families, the students’ prototype was a web portal for parents of children who have been referred for an ASD diagnosis and are waiting for an appointment. Users would be able to enter in their child’s needs and find resources they can utilize until their appointment comes up. The web portal would also have an algorithm to develop a tailored list of options based on the particular needs of the family. The meeting chair was so impressed by the McMaster students’ research that he shared the prototype on the projector. Meeting attendees used this work as a template of sorts to guide how they might create a similar resource, but for post-diagnosis. The reaction from industry leaders has only fueled the group’s momentum. In fact, two of the students who worked on the prototype, Anandarajan and Selvakumaran, are continuing with the project as a thesis, under the supervision of Dr. Georgiades. Keeping in line with design thinking’s collaborative ethos, MacART’s Research Coordinator Anna Kata and Postdoctoral Fellow Steve Gentles also continue to support the students’ work. Anandarajan, who is in her fifth year of McMaster’s Life Sciences program, shares Selvakumaran’s sentiment and credits her team’s success to the design thinking tools she learned in the Innovation by Design course. Facilitated by Dr. Sean Park, Innovation by Design I is an interdisciplinary course offered by the HLA that introduces students to design thinking tools and approaches. Students who are interested in applying what they have learned in a classroom setting are then able to enroll in Innovation by Design II to tackle real world, complex problems. Last spring, Anandarajan and Selvakumaran’s team was paired with MacART to develop potential solutions to the lack of resources for families facing an ASD diagnosis. Manager of the Health Leadership Academy and project mentor Amanda Calzolaio says that recognition from international experts shows the value of design thinking and the calibre of McMaster’s students. Aside from receiving endorsements from some of the brightest minds in the field, Selvakumaran and Anandarajan are working to test the prototype with more parents of children awaiting an ASD diagnosis. During the course, the team tested their website concept with one family, but now Anandarajan and Selvakumaran are looking to do more testing and iteration. Ultimately, Selvakumaran says the goal is to develop the website and test a live version within the Hamilton-Niagara region. He can even foresee scaling this service to other communities in Ontario, but that’s much farther down the road. For now, he and Anandarajan are keeping busy as peer tutors for the 2018 Innovation by Design cohort, and refining the MacART prototype. Dr. Georgiades says he is thrilled to see the students’ work progressing and earning attention from the autism research community. Importantly, he notes that this collaboration sold him on the power of design thinking. Note to the reader: Amanda Calzolaio is currently on maternity leave. Andreea Calic is the Acting Manager of the Health Leadership Academy.